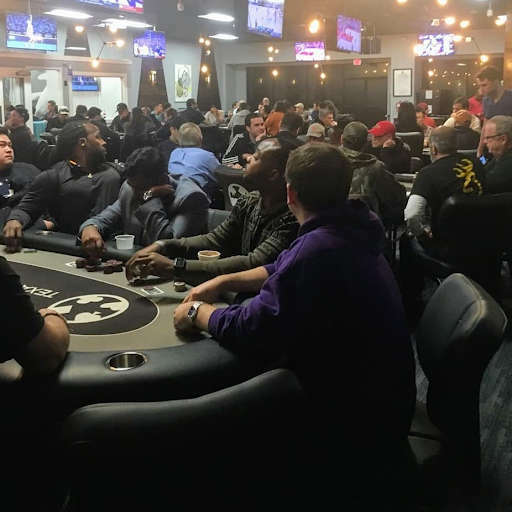 The Texas live poker scene is really hopping with venues like the Texas Card House catering to poker lovers in North Austin. The live Austin poker scene is booming despite the fact that there's not a single legal casino cardroom anywhere in the state. What's going on is that creative entrepreneurs have discovered a way around the restrictive TX anti-gambling laws. By providing poker games at clubs using a membership model, rather than levying a traditional rake, they are able to argue that they're not deriving any economic benefit from the gaming tables. The legalities surrounding this activity are a bit unclear, and it's not certain whether or not this line of reasoning would hold up in court. 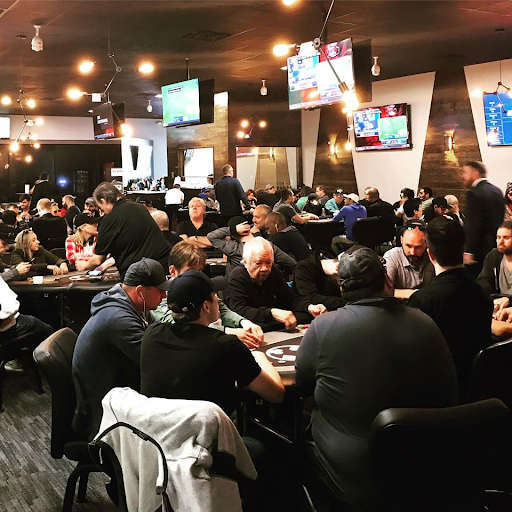 Nevertheless, these brick-and-mortar poker rooms are doing a brisk business at present, and despite sporadic raids against some of them in the past, it appears that they're mostly being ignored by the authorities for now. We here at ProfessionalRakeback feel that this is an exciting development, and we wish these establishments well in their efforts to circumvent the restrictive, moralistic dictates of grandstanding politicians and busybody bureaucrats. 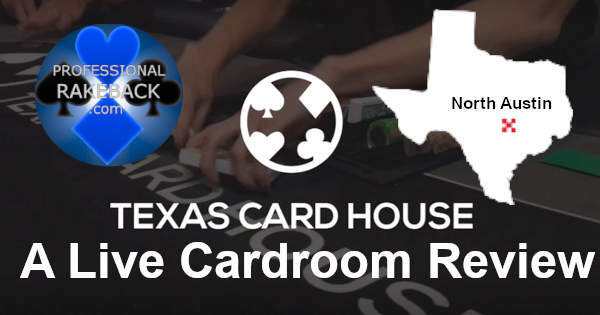 We decided to head over to the Texas Card House, one of the first organizations to deploy the membership-based poker business model, and one of the largest Austin poke rooms, to see what the action at the tables was like. Hours: Mon - Thurs, 11am - 4am, weekends, open Fri 11am through Mon 3am. Security: Private company. Two armed guards. Will offer to walk to your car. Miscellaneous: 25 TVs. You pay $10/hour at the end. $4 check-in fee. Daily membership: $10. Monthly membership: $30. Tips are allowed at the table (cash or tip chips). Food/Beverage: Free Water/Coffee. Drink and snack vending machines. Catered food every night of the week. Meal prep options in the fridge for $8. Pros: Mostly recreational players. Most popular club in Austin. Most tables running and least amount of wait-time. Cons: Tables are 10 handed. Texas Card House is the original legal poker club in Texas (at least, the first one not to be almost immediately shut down by the police). It has stood the test of time (three years) and paved the way for new card houses to follow. Sam Von Kennel, one of the owners, used his experience working with state lobbyists to cook up a recipe for legal poker. Opening in 2015 in south Austin, TCH was a pioneer in the field of membership-based social card clubs. Their south location has since relocated, to an over 5,500 square feet room in northwest Austin. Food is now catered (free) seven days a week, with Rudys BBQ on Saturday nights. A vending machine is in the back with low prices on an assortment of snacks. Drinks are sold in the refrigerator. Healthy, homemade meals are also prepared and available in the fridge for $8. Two new coffee machines, from ATX Coffee, are now available for free -- giving customers free, unlimited teas, espressos, hot chocolates, and coffees. Two armed security guards are onsite at all times and will walk you to your car if requested. The presence of multiple security personnel was perhaps a reaction to the unfortunate shooting of popular Instagrammer “3betpanda” at the property in 2018. Texas Card House has the best dealers and staff of all the Austin card rooms. They are run the most similarly to a casino, and they are the most professional. Games play big and play deep at Texas Card House. Even with the $300 cap on $1/2, it is common for there to be one to four stacks over $1K (500 BBs). Due to the fact that the tables are 10-handed (downside) and that most players play a loose-passive style (high VPIP), there is a propensity for pots to build really quickly. Most of what is available is $1/2, but at least one $2/3 and one $5/5 will run daily, usually opening after 5pm. The permitted buyin amounts for these stakes are: $1/2 ($100 min/$300 max), $2/3 ($200 min/$500 max), and $5/5 ($500 min/no max). The $5/5 plays as big, if not bigger, than your normal $10/20 or $10/25 game in Vegas. Average stacks in this game are around $2,000. Most of what is spread is NLHE, but multiple PLO tables will run every Friday and Saturday and often at least one PLO most other days. Texas Card House (northwest Austin) has become a poker enthusiast haven. For over three years, TCH has been tweaking and refining their model to better the experience. They have the most customer loyalty. They get the most new faces coming in. They are guaranteed to have the lowest wait times of all the card rooms and to have the most tables running. Their floor is WSOP-trained and it permeates across their entire staff. The downside of all this poker greatness is that sometimes the atmosphere and the vibe are a bit too serious for the casual fan. Dealers will enforce rulings strictly. No music or TV sound is ever playing, and that can be daunting to newer players. Their private rooms sometimes create a predatory atmosphere where bad players are lured in to their detriment. But for the most part, the patrons are happy, and they get along with each other. This is the place to play to put in serious volume. 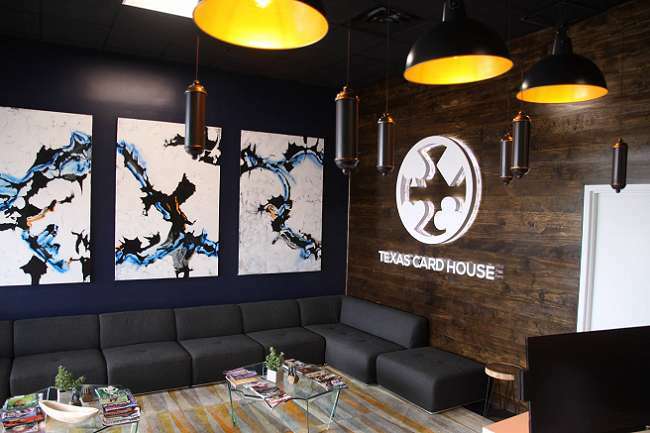 Texas Card House has announced that it will be opening up an additional location in Houston. 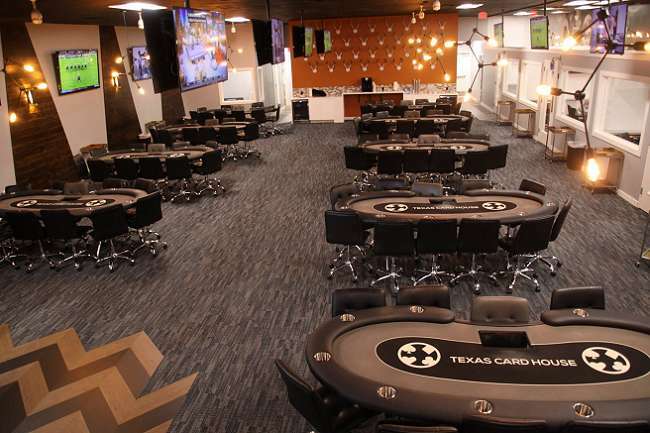 This facility is expected to go live in May 2019, and residents of the Greater Houston area will then be able to partake in the same excellent cardroom experience that has graced the Austin scene for four years. 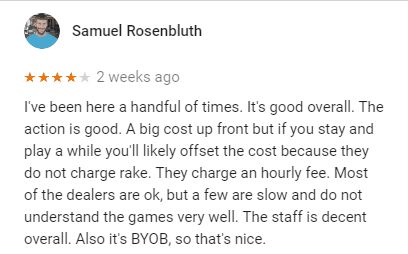 As a kind of sanity check, we prefer to see what others around the internet are saying about a particular venue for card games, whether online or live, before publishing our reviews. This allows us to gauge if our conclusions are reasonable or if there's something important that we've missed. The Texas Card House is a fine place for poker action, but there will undoubtedly be times when you don't feel like leaving the house to get your fix of betting action. Therefore, it behooves you to also sign up for one or more online poker outlets. Read our page devoted to offshore Texas poker rooms for more information. If you're not a resident of The Lone Star State, then consult our best real money online poker sites guide to learn more about the reputable operators that continue to serve Americans. Our reviewer, Robert Paape, is a professional poker player who primarily plays live in Austin, Texas. He has logged over 2,000 hours at Texas Card House and over 500 hours at Shuffle 512 and The Lodge. Robert previously owned and operated a legal card room in Austin in 2017 and understands what makes a good experience from both the customer and the business perspectives. Robert still plays online poker and travels to Vegas every summer.